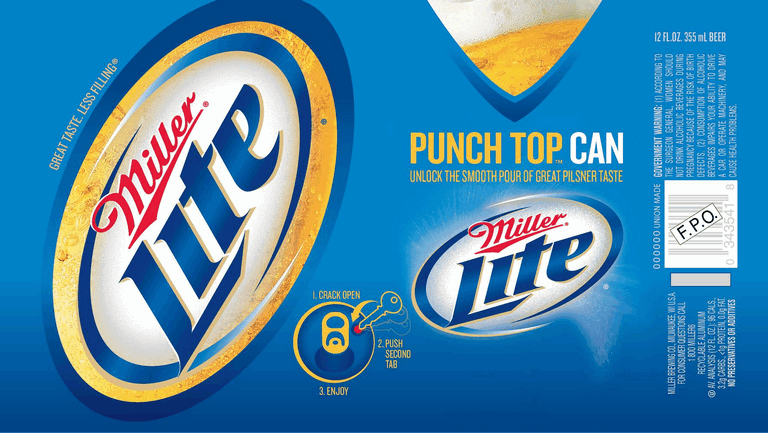 If you want a full article, rather than reactionary ramblings, check out this "Miller Lite Punch Top Can debuts this week" over at BeerPulse. As much as Budweiser makes me grown by churning out poor variations on their most popular product Bud Light, I've got to give them some credit. At least they're coming up with new products. Then again, that's the more sinister approach. By pumping out new products, they demand more shelf space in package, grocery, and convenience stores and have the chance of catching the eye of a beer shopper that is looking to "expand his/her horizons" and "try something new." But, alas, this is not about Budweiser coming up with new products, this is about MillerCoors spending "creative energy" churning out packaging redesigns. At least this one is practical, if you're goal is to improve the flow of beer to facilitate chugging. The last improvement from MillerCoors to a Miller Lite product was the "Vortex Bottle" that purported to do the same thing, but was a ludicrously made-up mechanism. Here, the punch tab in the top of the can, actually will improve air flow. It's like the marketing folks have been taking cues from frat guys and binge drinkers and have attempted to implement in-can shot-gunning. I think by next year they'll have put another punch out in the side of the can. What kills me is that this is clearly part of a larger pattern by MillerCoors. Rather than reworking the beer or improving the product they simply create a new, pointless, marketing feature. It's product differentiation without any substance. For Miller it was the Vortex Bottle, now the Punch Top Can. For Coors it's been an even more hilarious/pitiful series for the Coors Light line. The Cold-Activated labels, then Cold-Activated cans, then, the epitome of idiocy, the Cold Activation Window! "Another engineering marvel from Coors, we've cut a hole in our packaging!" All, just in case you're not able to accurately gauge that you've chilled your beer enough. Or, is it to help ensure that you never drink the beer at a temperature that most beer (read: not Coors and its cohort) is intended to be consumed. Because, after all, if you actually experienced the flavors of these beers and dared to compare, you'd perhaps find that there really is something better out there. Check out 69beers! They have it right. Man that could be great for my foul tasting protein drinks too. That bottle can rocks!